Active ingredient: piracetam - 800 mg.
Excipients (core): croscarmellose sodium, pregelatinized starch, povidone (polyvinylpyrrolidone), Magnesium stearate. Excipients (shell): hypromellose, macrogol, titanium dioxide. Piracetam activates associative processes in the central nervous system, improves mood, memory and mentality in sick and healthy people. Stimulates intellectual activity and integrative activity of the brain, facilitates learning processes, improves communication between the cerebral hemispheres and synaptic conduction in the cortex, improves mental performance, stabilizes and restores impaired brain functions (memory, consciousness, speech). 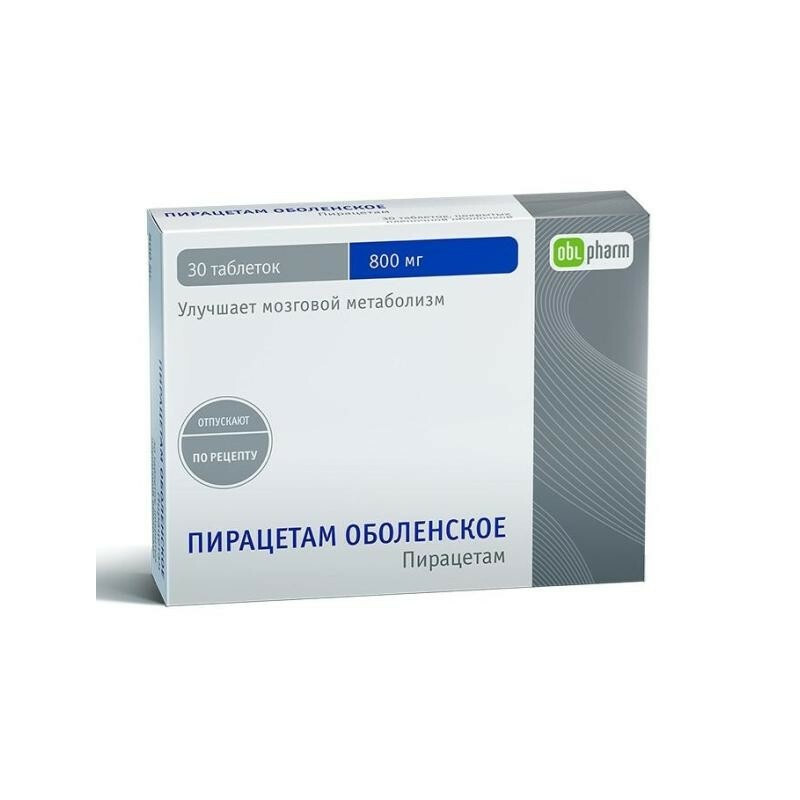 Piracetam normalizes the ratio of ADP and ATP (inhibits nucleotide phosphatase and activates adenylate cyclase), increases the activity of phospholipase A, stimulates bioenergetic and plastic processes in nervous tissue, accelerates the exchange of neurotransmitters. Piracetam increases the resistance of brain tissue to toxic effects and hypoxia, enhances the synthesis of phospholipids and nuclear RNA, enhances glycolytic processes and glucose utilization in the brain. Piracetam blocks platelet aggregation, improves microcirculation, optimizes the ability of red blood cells to pass through microvessels and the conformational properties of the erythrocyte membrane, and increases regional blood flow in ischemic brain regions. Piracetam enhances EEG beta and alpha activity and lowers delta activity. Reduces vestibular nystagmus. During hypoxia, intoxication, trauma, electroconvulsive effects has a neuroprotective effect. Due to its antihypoxic effect, piracetam is effective in complex treatment of myocardial infarction. Anxiolytic and sedative effects of piracetam are absent. Almost completely and quickly piracetam absorbed after ingestion. Bioavailability is 100%.When ingestion of 2 g of the drug, the maximum plasma concentration is 40-60 μg / ml after 30 minutes. Piracetam does not bind to plasma proteins. After 2-8 hours, the maximum concentration in the liquor is created. Piracetam penetrates all tissues and organs, and penetrates through the placental barrier. Almost not metabolized. Selectively accumulates in the cerebral cortex, mainly in the parietal, frontal and occipital lobes, basal ganglia and cerebellum. The plasma half-life of piracetam is 4-5 hours; from liquor is 6-8 hours. More than 95% of the drug is excreted unchanged by the kidneys after 30 hours. In patients with renal failure, the half-life increases. sickle cell anemia (as part of a comprehensive treatment). Taking piracetam is contraindicated during pregnancy. During therapy with piracetam, breastfeeding should be discontinued, as the drug passes into breast milk. Hypersensitivity (including to pyrrolidone derivatives), severe renal failure (with creatinine clearance less than 20 ml / min), hemorrhagic stroke, Huntington's disease, agitated depression, breastfeeding, pregnancy, up to 1 year of age. Piracetam enhances the effects of indirect anticoagulants, psychostimulants, central effects of thyroid hormones (anxiety, tremor, sleep disturbance, irritability, confusion). The severity of extrapyramidal disorders increases with the joint intake of piracetam with neuroleptics. During a meal or on an empty stomach, with a liquid. Symptomatic treatment of psychoorganic syndrome: 2.4 - 4.8 g per day in 2-3 doses. 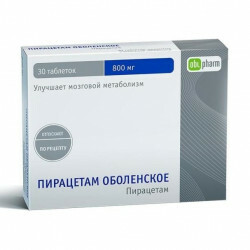 Treatment of dizziness and associated imbalance: 2.4 - 4.8 g per day in 2-3 doses. Treatment of cortical myoclonus: start with a dose of 7.2 g per day, every 3-4 days the dose is increased by 4.8 g per day until the maximum dose of 24 g per day is reached in 2-3 doses. Treatment continues throughout the entire period of the disease. Every 6 months, attempts should be made to reduce the dose or cancel the drug, gradually reducing the dose by 1.2 g per day every 2 days. Treatment of sickle cell anemia: the daily prophylactic dose is 160 mg / kg body weight, divided into 4 equal doses. Treatment of dyslexia in children (in combination with other methods of treatment): the recommended daily dose for children from 8 years old and adolescents is 3.2 g, divided into 2 doses. When overdosing with piracetam increases the side effects. Treatment: gastric lavage, taking activated charcoal, symptomatic treatment; there is no specific antidote, hemodialysis is possible (efficacy is 50-60%). In a dry, dark place. Keep out of reach of children.